Please read all the information regarding the training courses and the PDO Thread treatments provided plus review the treatment brochures to ensure you understand the treatments and training requirements. During the PDO thread lift course will use a combination of mono, cogs and barbed threads. Pre treatment: Local aesthetic injections before the treatment and antibiotics post treatment(precautionary). The PDO threads treatment is more invasive than other cosmetic treatments. Patients who choose this procedure will be required to take antibiotics to reduce the risks of infection. Threading is a new concept in aesthetic medicine. This is not a master class in threading as such, but a master class in treating the ageing face. The clinicians attending the PDO thread lift training course are already practicing cosmetic medicine and would like to add this treatment to their clinic. Lifting with threads is not new and we can draw comfort from this time-tested technique. More than 20 years ago gold threads were created to lift the face; there are still some practitioners using the technique today. In 1999 the permanent lifting thread Aptos was created from polypropylene (Anti-Ptosis). More recently the development of dissolvable threads has created a resurgence in interest of this well-proven technique, albeit with a few improvements and added benefits. The PDO threads are smooth and monofilament, ready threaded onto a small needle (27 or 29G). They are made from PDO (polydioxanone, used in surgery for 20 years and made by Ethicon). These threads initiate growth factor release through tissue trauma. Fibroblast activation commences new collagen formation which is remodelled at four weeks. New collagen has a tendency to shrink as it is remodelled. The effect is both volume and shrinkage due to the sheer number of threads inserted. Stimulating threads such as PDO should be considered as microfillers and microlifters, providing a meshwork of new collagen with initial tissue support and new collagen synthesis. 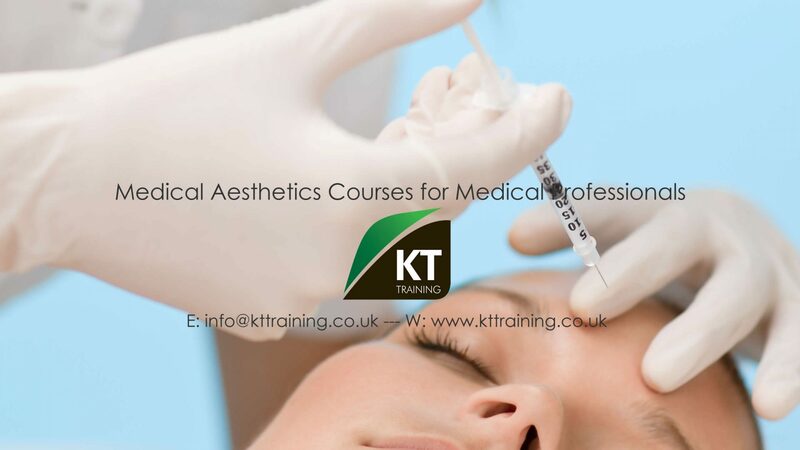 KT Training provide recognised courses for medical professionals. Patients are selected based on indications required and availability for each course. We provide only provide treatments for face and neck rejuvenation with the PDO threads at this time. The course is structured in 2 stages. Below are the indications covered on each stage of this course. KT Training provide scheduled dates for Stage 1 and 2. You can only have the areas covered in the specific stage treated on the day(see Stage 1 & 2 indications above). You will need to return at a later date to be treated for the other indications. Every procedure carries an element of risk. We do our utmost to minimize risk, and although the chance of an untoward event occurring is very small it may be significant if it happens to you. We will provide antibiotics to reduce the chance of infection. 1. Discomfort, bruising, infection and swelling may all occur as per all procedures that involve breaking the skin. 2. Scarring from the track of the thread. 3. Damage to deeper structures. The thread is inserted just below the skin so deeper structures are not normally at risk. 4. Allergy to the threads. This is very rare since the threads are no-allergenic and used in current surgery practice. Sometimes the local or injected anaesthetic can cause an allergic reaction which may require additional treatment. 5. Pigment changes. Rarely the skin can suffer pigmentary changes. It is important to avoid the sun for at least four weeks following the treatment. 6. Perceived asymmetry. We put the same number of threads into each side of the face. We do not aim to correct asymmetry unless specifically requested. Even so, existing asymmetry will remain. 7. Additional treatment. Sometimes a further treatment may be required to achieve the desired results. The PDO Thread is NOT recommended if the patient has any of the following conditions or treatments. An uncomfortable and pulling feeling may occur for a few days. If any symptoms occur for more than period stated above please contact KT Training. There is also the possibility of the following adverse reactions. KT is not a hospital or clinical facility and does not diagnose illness or provide medication. Consult your health care provider for advice on health matters. please read our conditions and disclaimer. Review all treatment information provided on this site before attending as a patient.